Hey apple, I sent you an email. Please read it. I dont know if you had gotten it. Please use the ban appeals section of the forum to post an appeal and have the situation reviewed properly. Hey apple! When you have time, could you take a look at this claimblocks thing that messed up? Sent you a PM about it. Hey Applebranch, I've spent a lot of time building my base on Applecraft. I've been playing on that server for a little over a year and my entire castle that I built with a friend is in the Blue World. Is there any way I can have the world download so I can keep it before everything is transferred to Purple world? I can't use Schematica to transfer my build to Purple I already saw that option. There is already going to be a world download for everyone once it's removed in January. Where is that going to be available? It'll be on the forums. am i going to be unbanned? did lav get demoted cause of mod abuse? 1: lav bans me out of rage. 2: lav gets demoted the day later. 3: will i stay banned? Hi apple, I need help. I can't get on applecraft, when i press join server it says that the network is unreachable. Can you help? I've purchased ELITE RANK and it doesn't work, something wrong on it. my username is Chathuranga. kindly take a look. Can you update the server to 1.12.1? I can't get on because the server is 'outdated'. Suggestion: I think that all mythicals should be able to have hats or /back or something like that. I think this because us mythicals have been on the server for a long time and that we should be rewarded for it. 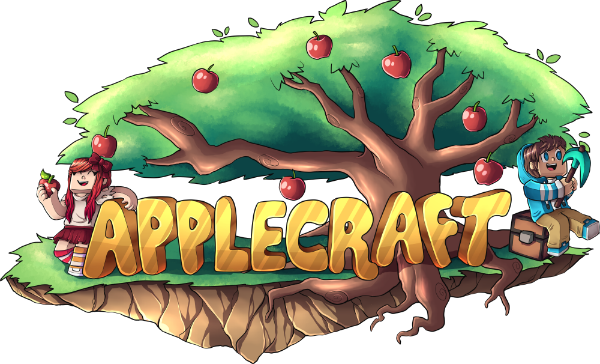 Suggestion: Update the vote link websites to reflect that Applecraft is now on 1.12. When I joined this server, I did so from seeing one of those vote things, and would not have joined if it had not been the most recent update. Question : How long will the limited edition items be for sale ? I can buy it next week but I'm wondering if they're still for sale than. FYI: Don't post ban appeals here, guys. I build 5 hours to impress the server..